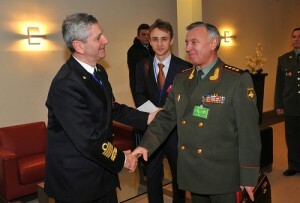 Russia is considering cooperating with NATO on anti-missile defence systems and other areas, the transatlantic alliance’s top military officer, Italian admiral Giampaolo Di Paola, said Thursday. “Missile defence has … been named by General (Nikolai) Makarov, as an area in which we could look,” said Di Paola, referring to his Russian counterpart, following two days of talks. That areas of cooperation in the approved plan “are limited” Di Paula admitted, to the fields of logistics, search and rescue, exchange visits and joint conferences. Also US Vice President Joe Biden visited Brussels, speaking of European security and in favour of NATO collaboration with Moscow in the anti-missile area. While this would include US hardware, the NATO chief distinguished this from the missile shield project once touted by former US president George W Bush which was drawn up to defend US territory from missile attacks overflying Europe, and was strongly opposed by Moscow. Rasmussen said it would “make sense, from political and military perspectives, to speak with Russia” about the plans. NATO and Russia have for several years collaborated on a much more modest anti-missile programme to protect military installations and troops. Russia has been resistant, fearing an extension of the US missile shield project in Europe which could upset the conventional and nuclear balance to its own detriment. President Dimitri Medvedev in 2008 proposed rather a “security pact” stretching from Vancouver to Vladivostock.